The Sidi Aria Gore-Tex Boot is one of two boots we sell that feature Gore-Tex as the main waterproofing material and offer a shell that is a blend of solid micorofiber and breathable Cordura fabric material. The competing boot is the very similarly styled TCX AirTech Evo boot. 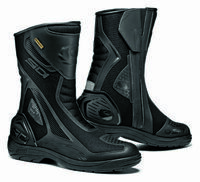 The combination of GoreTex, which is the most breathable material for waterproofing, coupled with the breathable upper is a perfect boot for the warm weather/all weather rider. Just like I did with the previous model, I had to give this new version the lip lock test… put my lips on them and blow! Sure enough, I could feel my breath slowly seeping through! And while I can’t say they are “free flow”, the air flow properties will be as good as it gets for a waterproof boot. This boot has a nice cushy interior and will be comfortable for just about any sort of street use. After breaking these in, I think you’d be able to wear them on or off the bike very easily. The overall height of the boot I’d characterize as “medium”. If you ever want to know the exact height of a boot or the thickness of the sole, just check our photo gallery. We offer pictures with a yardstick inside the boot so you can easily see what you are getting.